David and Beverly have entered a new stage of life. They are on the road for much of the year, but they still need a home base in the city for the time they do spend here. They’ve decided to take advantage of the opportunity the city has offered and add a second home onto their property. Denver has included two ways to do this; one is the more familiar Accessory Dwelling Unit, which is limited in size. The other is called a Tandem House. The bulk and height of a Tandem House is regulated but the size in square feet is not. David and Beverly can add a new home for their use in the backyard of their current home and they can rent or possibly sell the older home. Many single-family homeowners in Denver have TU zoned properties now that can choose to add an Accessory Dwelling or a Tandem House. Do you think we would sell more backyard cottages with a headline like this? Of course we could, but it’s misleading. In many localities $30,000 wouldn’t cover the fees when building a new small house in the backyard, and this advertised price leaves out many other costs as well. The $30,000 figure is a modular company’s price for a minimally finished 500 square foot house at the factory. They acknowledge that the same house decked out for show would cost $75,000 and that still leaves out transportation costs, installation, foundation, utilities, earthwork and more. Cars are advertised starting with a base price and go up from there but you don’t need any more than what is offered in the base price for transportation. The base priced car still includes the engine, the wheels, the steering wheel, and it runs, but the base priced modular house is sitting on the manufacturer’s lot without water service, sewer service or power and you can’t live in it. I think the car companies do a better job of fairly advertising their prices and delivering their products. Determining a home's square foot area is a simple mathematical calculation that is often confusing because sellers don’t use the same method of computation. In the past there was no published standard method for calculating the size of a new home or Condominium so builders and realtors were free to use any method they felt was reasonable. The problem was the lack of uniformity, which showed up when sellers published square foot prices based on inflated home sizes due to questionable calculating methods. These homes were exaggerated in floor area, and square foot prices were artificially low. The biggest problem came when vaulted spaces became increasingly popular. Many sellers treated rooms with high or vaulted ceilings no differently in their floor area calculations, while others counted that vaulted space as floor area or for some unexplainable reason, as 50% of those high ceilinged rooms as floor area. The logic goes; vaulted space costs more to build than space with conventional height ceilings so that should be expressed in floor area. To further complicate the already confusing situation, some sellers calculated floor area to the inside face of all exterior walls instead of to the exterior face. (That paint-to-paint method is still used in defining condominium ownership but not floor area). Sellers that took advantage of the situation gained an unfair competitive position, for example: A 2400 square foot house, with floor area calculated according to today’s standards, could have appeared as a 2600 square foot house by including vaulted or two story rooms as additional floor space. Not only did a buyer appear to be getting a larger home, the square foot price of that home, if priced at $250,000 in both cases, would appear to be less, $96 per square foot vs. $104 per square foot. -Gross Floor area is measured from the outside line of all exterior walls, the garage side of all attached garage walls and the centerline of party walls between living units. -Stairs are included in both the first and second floor area calculations. -Fireplace and chimney walls outside the exterior wall line are not included. -All storage rooms, utility rooms, laundries, etc. within a home are included in the total gross floor area. -Two story or vaulted spaces are not included within floor area. -Attached garages and attic spaces with ceilings below an average of 7 feet high or below 5 feet anywhere are not included. -Patios and Decks are not included. -Unfinished basements are not included. -Crawl spaces are not included. In the case of a Carriage Home above a garage the method described is not always what individual cities use to regulate minimum or maximum Accessory Dwelling Unit (ADU) size. 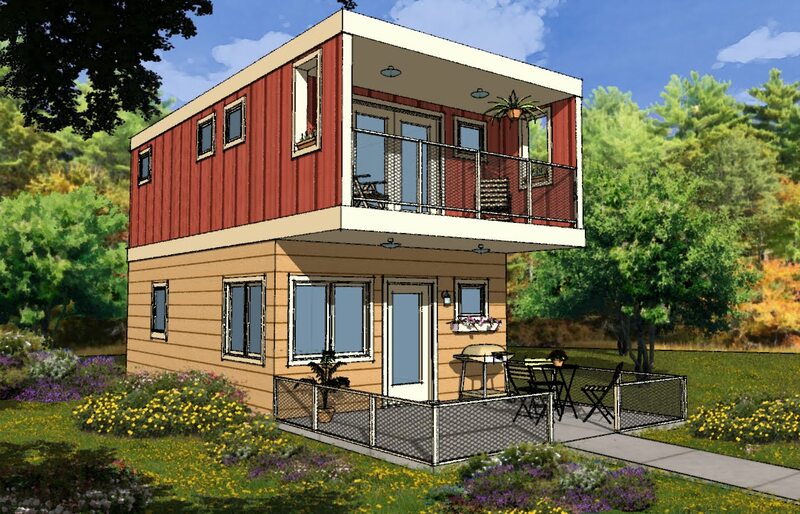 For example; Madison Wisconsin limits an ADU size to 640 square feet. Does that area consider the entry on the first floor and the stair required to the second floor above a garage, or is that intended to regulate the second floor living space? We don’t have our answer from Madison yet. If we choose to put the stair outside and enter the building at the second floor landing does the stair and landing count as floor area? These questions must be put to each city since most do not have those answers readily available. To add to the confusion, Denver, CO uses gross floor area for site coverage and open space calculations but when calculating the size of an ADU to determine compliance with the maximum area allowed they use “livable floor area” which does not include exterior walls, baths, halls, mechanical rooms, or laundries, etc. Just be aware is all we can offer in the way of advice. Home sizes may not be as difficult to confirm as they once were but there are exceptions that could be important, such as on an appraisal.